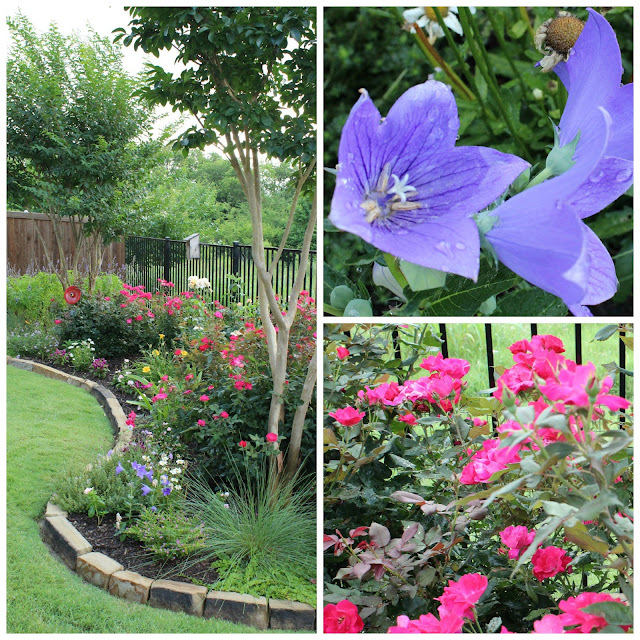 Welcome to our June garden! This is our third year in this house and the garden is coming into its own. We made the front flower bed really large and deep and filled it will lots of layers. We are so happy with the way it's all doing now. "it was kind of weird to put in such a big bed in the front yard but it sure looks nice". That was a sweet compliment because he has a beautiful yard too. 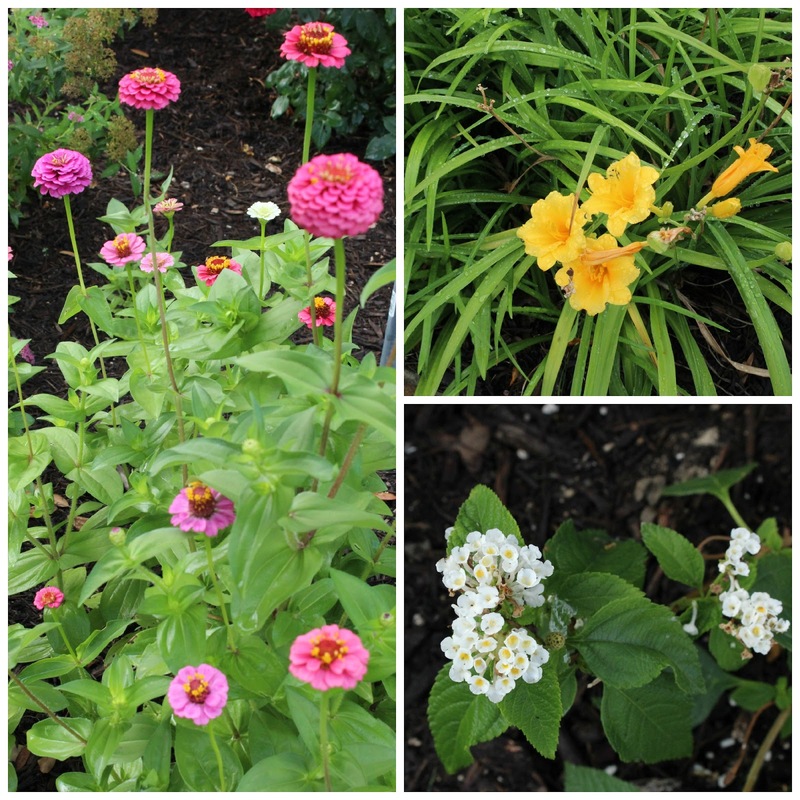 Our beds are mostly filled with perennials and each year we add in a few annuals. My favorite cheap trick is to include zinnias planted from seeds. In the backyard we followed the same general ideas. Our backyard overlooks a greenbelt that gives us so much natural beauty to soak up. Belle keeps guard over the bunnies and birds. She's pretty sure they fear her. We have a concrete pig...don't you? We love our backyard. It's a place of peace and relaxation. Hope you are having a wonderful Monday. See peeks of July 2015 here. Hi Stacey, your gardens front and back are gorgeous. Love the pig and Belle is precious. Beautiful pics. They are saying lots of rain on the way here. GORGEOUS Stacey!! I love the layered garden you created in the front of your house!! Love your yard Stacey! It is so pretty and filled with so much color! I love zinnias too and had planted them at my old house! I loved cutting them and making bouquets for my home! Have a great week! June is looking very pretty in your yard, Stacey. 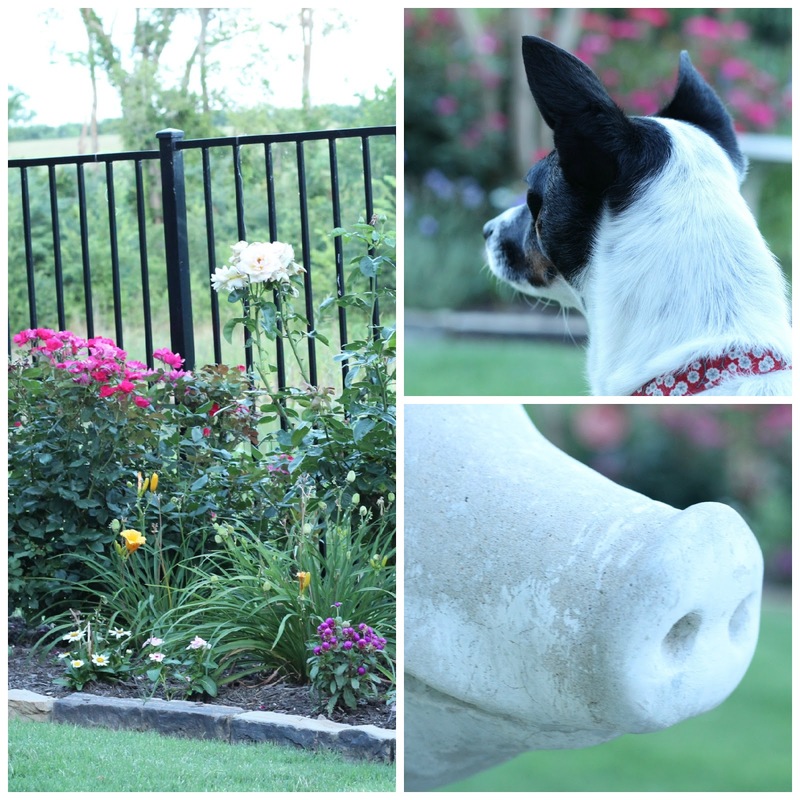 The garden beds you have created are just beautiful and the piggy's snout in your collage made me laugh. Love your gardens both front and back. Gorgeous. My flowers give me peace too. Have a great week. Your yard is so beautiful! I bet you really enjoy it out there. Stacey - Your gardens are charming and beautiful! Your yard is beautiful! It's very manicured and I love all of the flowers in bloom. OH Stacey, your gardens are beautiful! I would love working out there, and just relaxing, too! I think a large bed is awesome! What a fabulous way to brighten your day, every single time you come home. I love it...and you obviously have a very green thumb. Ps- Pigs are my favorite!! Absolutely gorgeous, Stacey. The colors are so joyful! Love both your front and back yards. I love it when people don't have so much lawn and choose gardens instead. Just lovely Stacey!! Both front and back gardens are amazing. Going back for another , and maybe a few more peeks. We are in the process of redoing our back harden and I can use the inspiration. 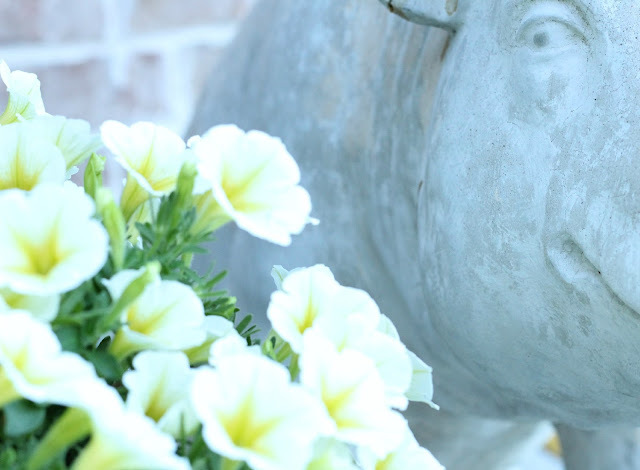 I don't have a concrete pig...but I wish I did! Your gardens are spectacular! Stacy, what a glorious front garden and the back is just beautiful too! Nothing like having a wonderful place to relax and enjoy! Love the zinnia idea! Stacey, your gardens are beautiful! I am really envious of these flower beds. I've been working on mine for 3 years and I think it will be another 30 to look like yours! Beautiful gardens Stacey-love the layering! Ha ha! I DO have a concrete pig! He resides by my patio and his name is Wilbur. Original, huh? ;) Beautiful flowers! How pretty! You must feel so happy every time you step out the door. Oh Stacey! Your beds are beautiful! I love all the variations in height and color. Very English country! Beautiful, Stacey! It looks so lush! Just beautiful! Our house came with deep beds. Luckily, most of the plants come back each spring, but there are still some gaps. You have inspired me to fill them! Your yard front and back is absolutely stunning! I LOVE all of the flowers! Love all the flowers and the green... it is so hard to get anything that pretty here in Phx in the summer time. You guys did a great job putting it all together. Stacey, I love your garden. It is so beautiful, a joy to look at, and your plants are all doing so well. We are trying hard here in Southern California to have our garden look like it normally does, although our severe drought and watering restrictions have made it a bit difficult. Thank you for sharing your flowers. No, we have a concrete fish! I have always admired your most beautiful yard!!! Third year is the charm. Absolutely beautiful!!! Perfect piggy too! Your yard is simply gorgeous Stacey. I have an inspiration picture for my new yard and a plan to follow. It will take a few years to get there though! I can tell you've put a lot of work into getting yours perfected. I thought everyone had a concrete pig! ;) We do, albeit a LOT smaller than yours. I like the idea of a large bed and not so much grass. Grass looks nice, but flowers look even nicer. 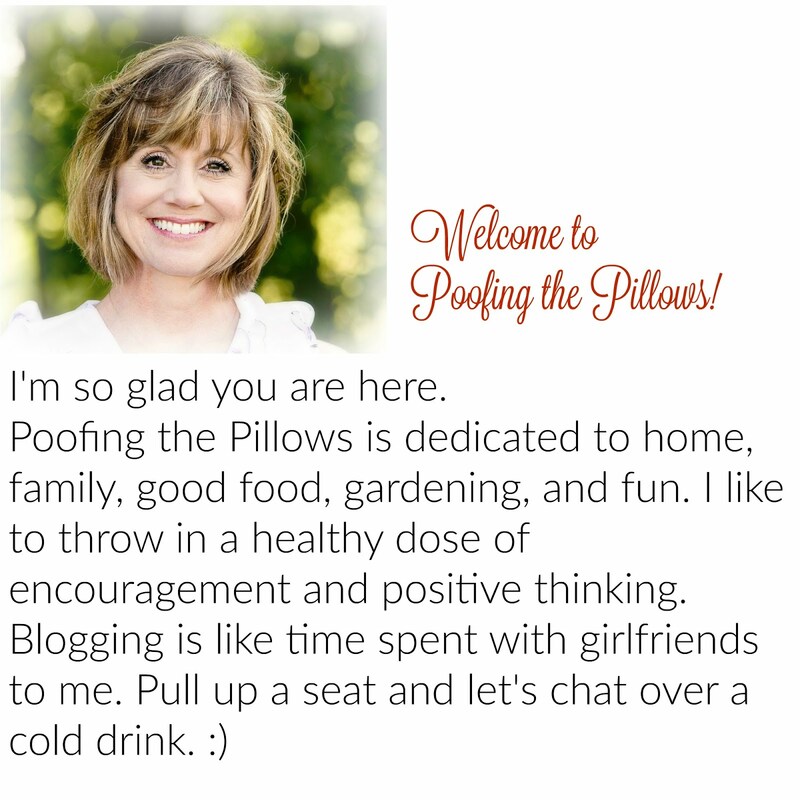 Stopping by from Brenda's to say 'hi' and have a look around your lovely blog Stacey. Looks amazing maybe you can give me some tips. I need to start a huge flower garden in my backyard. I have this horrible spot that used to hold a enormous playground. In the future long off future we may add on to our house but for now I want to plant something like your front bed around with a walking path and maybe put another fire pit. What are some plants that do well in heat, and what did you use if you can remember? I love your choices!! Oh, I cannot wait for June to roll around again. Your garden is lovely. I especially love the rose bushes and zinnias.